Jaguarundi is the common name for a small- to medium-sized New World wild cat, Puma yagouaroundi, characterized by an elongated, "weasel"-like body, short legs, rounded ears, long tail, and an unspotted fur that comes in a few different color morphs. The jaguarundi is found in Mexico, Central America, and South America. Jaguarundis plays an important role in terrestrial ecosystems through control of their prey species, which includes small mammals, birds, and other vertebrates. In controlling mice, rats, and rabbits, they also control the population of agricultural pests. The jaguarundi is is not particularly sought after for its fur, but it is suffering decline due to loss of habitat and habitat fragmentation. They also are killed as predators of poultry. 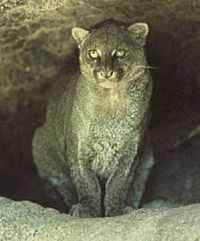 The jaguarundi is listed as Least Concern on the IUCN Red List. However, it is believed to be much less abundant than commonly perceived and could even be in Near Threatened status except for the lack of information to access. The jaguarundi is protected in many nations, including Brazil, Argentina, Uruguay, Paraguay, Bolivia, Mexico, among others. The jaguarundi (Puma yagouaroundi) is part of the Felidae family, which belongs to the Carnivora order within the mammals (Class Mammalia). Felidae usually is divided into two subfamilies, Pantherinae (which includes "big cats" like lions, jaguars, tigers, and leopards) and Felinae (which includes the "small cats," although some can be large, like the cougar). The jaguarundi is part of the Felinae subfamily and share the same genus, Puma, as the cougar (Puma concolor). The jaguarundi is a small-sized felid, somewhat larger than a domesticated house cat (Rick and Lundrigan 2004). The head and body length averages about 65 centimeters (30 inches), ranging between 50.5 and 77 centimeters, with a long tail about 45 centimeters (20 inches), ranging from 33 to 60 centimeters (Rick and Lundrigan 2004). Jaguarundis weight about 6 kilograms (13.2 pounds), ranging from 4.5 to 9.0 kilograms (Rick and Lundrigan 2004). The shoulder height is approximately 35 centimeters (14 inches) (Rick and Lundrigan 2004). The jaguarundi has short legs and an appearance somewhat like an otter. Early German zoologists called the species "weasel cat" because of its resemblance to members of the family Mustelidae. the jaguarundi has short and rounded ears. It tends to be smaller, more elongated, and with sorter limbs than other small neotropical felids (Rick and Lundrigan 2004). The coat of the jaguarundi is unspotted and uniform in color. There are several color morphs, and varying from blackish to brownish gray (gray phase) or from foxy red to chestnut (red phase). The two main color phases—dark grayish-black and reddish—were once thought to represent two distinct species; the gray one called jaguarundi, and the red one called eyra. However, these are the same species and both color phases may be found in the same litter (Caso et al. 2008; Rick and Lundrigan 2004). Its coat has no markings except for spots at birth. In some Spanish speaking countries, the jaguarundi is also called leoncillo, which means little lion. Other Spanish common names for the jaguarundi include: "Gato colorado," "gato moro," "león brenero," "onza," and "tigrillo" (Caso et al. 2008). As with all members of Felidae, the jaguarundi walks on four feet, in a digitigrade manner—that is on its toes. The jaguarundi is found from central Argentina (at about 39°S), through Uruguay, Brazil, and Paraguay, and north through the rest of South America and through Central America to the eastern lowlands of Chipinque National Park in Nuevo Leon, Mexico and the western lowlands of Mexico (Caso et al. 2008). There are reports of the jaguarundi being found as far north as southern Texas and Arizona in the United States, but such sightings are not well documented (Rick and Lundrigan 2004). Caso et al. (2008) report that it is probably extinct in the United States. The jaguarundi is mainly a lowland species below 2,000 meters, but is found up to 3,200 meters in Colombia. Its occupies a broad range of habitat, from desert to shrub land, to grassland, to swamp, to primary rainforest. It is well known to inhabit lowland brush areas close to a source of running water. It occasionally inhabits dense tropical areas as well, although it suffers in competition with the ocelot and other larger felids. It is not the dominant small cat species in most areas (Caso et al. 2008). The jaguarundi is mostly terrestrial, preferring to hunt on the ground, but it also is a good climber and is comfortable in trees. The jaguarundi is considered to be mostly diurnal (Caso et al. 2008), although it may exhibit crepuscular and nocturnal behavior depending on location. It can avoid direct competition with ocelots through diurnal behavior (Rick and Lundrigan 2004). They are good swimmers and climbers (Rick and Lundrigan 2004). The jaguarundi is a carnivore and preys upon fish, small mammals, reptiles, amphibians, and birds, including rabbits, mice, rats, junglefowl, and iguanas. Some plant material and arthropods are also consumed, based on stomach contents (Rick and Lundrigan 2004). While the diet is mostly small animals with a mean prey mass of 380 grams, larger sized prey greater than 1 kilogram is not unusual (Caso et al. 2008). This cat is closely related to the much larger and heavier cougar as evident by its similar genetic structure and chromosome count; both species are in the genus Puma. However, the jaguarundi sometimes is classified under a separate genus, Herpailurus and until recently, both cougars and jaguarundis were classified under the genus Felis. According to a 2006 genomic study of Felidae, an ancestor of today's Leopardus, Lynx, Puma, Prionailurus, and Felis lineages migrated across the Bering land bridge into the Americas approximately 8 to 8.5 million years ago. The lineages subsequently diverged in that order (Johnson et al. 2006). Studies have indicated that the cougar and jaguarundi are next most closely related to the modern cheetah of Africa and western Asia (Johnson et al. 2006; Culver et al. 2000), but the relationship is unresolved. It has been suggested that ancestors of the cheetah diverged from the Puma lineage in the Americas and migrated back to Asia and Africa (Johnson et al. 2006; Culver et al. 2000), while other research suggests the cheetah diverged in the Old World itself (Barnett et al. 2005). The outline of small feline migration to the Americas is thus unclear. ↑ A. Caso, C. Lopez-Gonzalez, E. Payan, E. Eizirik, T. de Oliveira, R. Leite-Pitman, M. Kelly, and C. Valderrama, Puma yagouaroundi. In IUCN, 2008 IUCN Red List of Threatened Species. Retrieved December 1, 2008. Barnett, R., I. Barnes, M. J. Phillips, L. D. Martin, C. R. Harington, J. A. Leonard, and A. Cooper. 2005. Evolution of the extinct Sabretooths and the American cheetah-like cat. Current Biology 15(15): R589–R590. Retrieved December 1, 2008. Caso, A., C. Lopez-Gonzalez, E. Payan, E. Eizirik, T. de Oliveira, R. Leite-Pitman, M. Kelly, and C. Valderrama. 2008. Puma yagouaroundi. In IUCN, 2008 IUCN Red List of Threatened Species. Retrieved December 1, 2008. Culver, M., W. E. Johnson, J. Pecon-Slattery, and S. J. O'Brein. 2000. Genomic ancestry of the American puma. Journal of Heredity 91(3): 186–97. PMID 10833043. Retrieved December 1, 2008. Johnson, W. E., E. Eizirik, J. Pecon-Slattery, W. J. Murphy, A. Antunes, E. Teeling, and S. J. O'Brien. 2006. The Late Miocene radiation of modern Felidae: A genetic assessment. Science 311(5757): 73–77. PMID 16400146. Retrieved December 1, 2008. Rick, J., and B. Lundrigan. 2004. Puma yagouaroundi. Animal Diversity Web. Retrieved December 01, 2008. This page was last modified on 31 July 2013, at 13:11.